Choosing the right web host for your E-commerce is like choosing the right location for your business- and it’s all about location, location, location. If for every 100ms of loading time, you lose 1% of sales, it’s obligatory that your E-commerce is fast, optimized, and user-friendly. Choosing the right web host can be the difference between having a site load lightning quickly, or a site that lags despite being light and server-friendly. 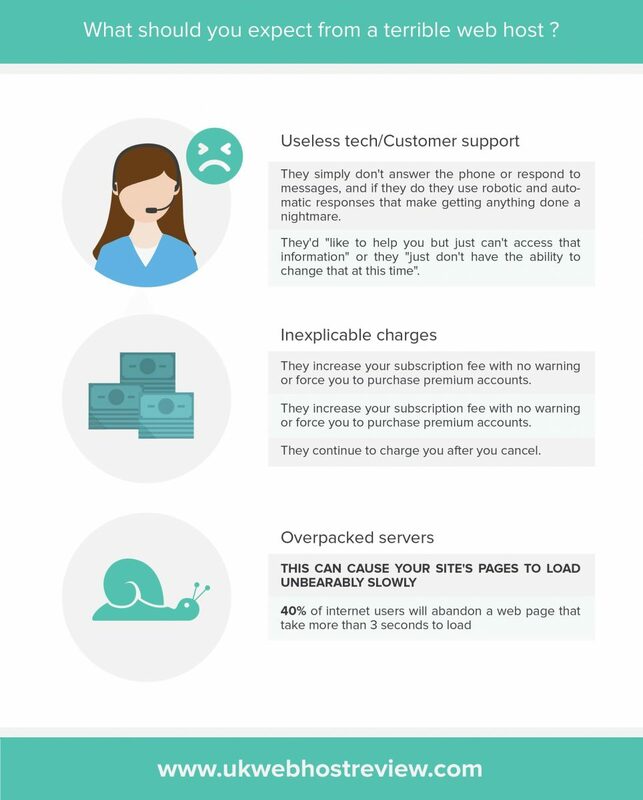 Here is a great infographic by ukwebhostreview with some tips about what you need to know about a web host. Cost: How much do the services cost? Scalability: Can you adapt your service based on your needs? Customer Service: Will they be there for you? Server performance and limits: will there be enough space and bandwidth for your E-commerce? When choosing a web host that’s right for your E-commerce, you need to think about what you need exactly. It’s great if you’ve got this awesome site that’s huge and powerful. However, that site will fail if you have chosen a web hosting service that isn’t adapted to the size of your site. On the other side of that, if you’ve purchased a service with 10 gigabytes of bandwidth and your site is using less than 4, you’re paying far too much for your service. A good web host will have scalability options that allow for your business to shrink or grow (preferably the latter) as necessary. If you choose something that’s too big for what you need at first, you should be able to shrink down your service so that you’re not paying a huge amount for little used resources. Also, going over your disk space or bandwidth is terrible for online retailers. This can cause lag, or worse, your website can go down completely. For those looking to make their business grow, a lot of hits on your website at once could be the kiss of death if your server isn’t prepared to handle the traffic. Perhaps most importantly, is your web host going to be there if such a thing happens? You have to know how you’ll be able to contact your web hosting service provider. Do they have a 24/7 emergency hotline? Are they particularly responsive to emails or on-site chat? Will they be there if your site goes down at 3 a.m.? The short answer is yes, they have to be accessible when you need them to be. What’s more, is your web host’s team competent? Do they actually know what you need to do to fix your problem? You don’t want to be left out in the cold when things go wrong (and trust me, they will from time to time). Almost every webhost will offer 99%-100% of uptime (not including scheduled maintenance). Keep in mind that 99.5% of uptime means that for 50 minutes per week, your site will be inaccessible. It’s up to you to determine if that is acceptable or not. The goal is to get it as close to perfect as possible, because when the server goes down, your hands will be tied. There are important things listed in the terms and conditions. The most important things you’ll have to pay attention to are your bandwidth and disk space limits. You need to choose a service that will allow you to grow, without giving you too much too quickly. The best way to see how much disk space you need is to simply look at your website on your local disk and click on properties. You’ll be able to see clearly how much the code, images, and data takes up in terms of bytes. If you’re still building your site, you can check one sample page and make an educated guess based on how many pages you plan on having. Again, be sure to allow yourself some space to grow. Bandwidth can be a bit trickier. At first, it’s a bit of a guessing game. There’s not an easy way to predict how much traffic you’ll have. Once your site is launched, you should be able to figure it out after a few months of careful tracking. There’s a simple formula noted on www.whoishostingthis.com which tells you how you can figure out your bandwidth needs. There are likely to be extra services looped into the package you choose. Look at them carefully and make sure they’re pertinent for your business. There could also be some interesting programming and optimization services that will make your life easier. Choosing a web host is an important part of getting your E-commerce business in place. Be sure to pick the one that offers you something that will evolve and adapt with you and your business needs over time. This will save you plenty of optimization headaches down the road. What is the most important factor in choosing a good web host? Tell us below or tweet us! [#Infographic] CMS Comparison: WordPress vs Joomla vs Drupal – Which is Better?